NEW YORK—The nationalities and ethnicities of the New York Concerti Sinfonietta’s International Competition winners were so diverse, they foreshadow the Parade of Nations at the opening ceremonies of the 2016 Summer Olympics in Rio de Janeiro. Countries represented included Australia, Germany, India, Ireland, Korea, the People’s Republic of China, Sweden, Taiwan, Turkey, the Ukraine, and the United States. Appropriately enough, a 2016 International Shining Star participant from Utah was the overall champion of his high school Academic Olympiad. The Sinfonietta presented its Shining Stars Debuts June 1–6 in a series of five concerts. The June 3 flagship performance was given at Carnegie Hall’s Weill Recital Hall, with the remainder taking place in two historic Manhattan churches: St. Gregory the Great and St. Francis of Assisi. Carnegie Hall is currently celebrating its 125th anniversary season. The Sinfonietta’s June programs comprised three concerto concerts with orchestra (enhanced by solo performers and chamber music), and two recitals. The players represented all ages, from gifted elementary school students, through those just launching their careers or in mid-career, to seasoned adults and guest artists. Dr. Julie Jordan is Artistic Director/Founder of the New York Concerti Sinfonietta. 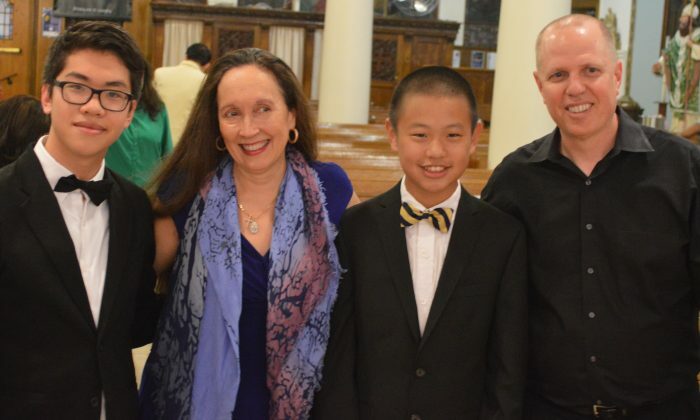 Last year marked her 30th anniversary as a piano faculty member of The Juilliard School Evening Division. Paul Hostetter of Columbus State University–Georgia is principal conductor of the New York Concerti Sinfonietta. Both Dr. Jordan and Maestro Hostetter are Juilliard alumni. Although there was some duplication of repertory in the June concerts (Chopin’s Ballade No. 1 and Rachmaninoff’s Piano Concerto No. 2 were each played by two different performers), it was an opportunity to savor contrasting interpretative concepts. Other works were rarely heard and welcome novelties, such as a seldom-played Mendelssohn piano trio, an early Mozart piano concerto, orchestral songs by Vaughan Williams, and a virtually unknown clarinet concerto by jazz master Artie Shaw. Many of the performances at the June concerts were exceptional, leaving lasting impressions that will long linger in the memory of the audience. Born in Dublin, Ireland, 21-year-old David Tobin is currently studying in Cologne, Germany. At Carnegie Hall, he played the finale of Max Bruch’s Violin Concerto No. 1 in G Minor, Op. 25, followed the next day by the same concerto’s first movement. Tobin’s sonority was sumptuous. His bow virtually glued to the strings, he utilized the full extent of it from frog to tip. His solid, opulent tone was reminiscent of the renowned David Oistrakh, whom I had heard in the late 1960s at Carnegie Hall. I was therefore not surprised to learn that Tobin is currently a pupil of a protégé of Oistrakh. Approaching the Bruch Concerto with dignity and gravitas, Tobin played with attack, impeccable intonation, and abundant virtuosity, avoiding superfluous physical motion. Standing rakishly with feet apart, leaning backward from the waist in a slight crescent, he cut a dashing figure. His posture and luxuriant head of jet-black hair looked strikingly like the famous 1832 painting of Paganini by Delacroix at the Phillips Collection in Washington, D.C.
Tobin’s playing was deserving of comparison with this legendary predecessor. Tobin owns a tonally luscious, vintage violin made by Johann Carol Klotz of Mittenwald, Germany in 1764. Tobin was also presented by the Sinfonietta in a full-length duo recital at St. Francis on June 1. Notable were a passionate gypsy-style Czardas by Monti that practically dripped honey, and an unaccompanied “Danny Boy” (befitting Tobin’s Irish heritage) that was so haunting, it prompted a woman in the audience to quite audibly hum along with it. Tobin was partnered with 21-year-old Ukrainian-born German pianist Victoria Kleymann. Her solos included a lyrical, poetically ruminative First Ballade by Chopin and a commanding, playful, and nuanced Tenth Hungarian Rhapsody by Liszt, which evidenced far more than mere virtuoso finger display. Swedish cellist Antonio Hallongren graduated this spring from The Juilliard School, where he served as principal cellist of the Juilliard Orchestra. On June 3 and 4, he delivered one of the finest performances of Tchaikovsky “Variations on a Rococo Theme,” Op. 33, it has been my privilege to hear. Swedish cellist, Antonio Hallongren, playing Rococo Variations with the the New York Concerti Sinfonietta in Carnegie Hall on June 3, 2016. Playing the traditional Wilhelm Fitzenhagen version, Hallongren provided an aristocratic and poised account. The opening theme was exquisitely phrased, with each variation vividly characterized. His playing was unusually beautiful and expressive, reminding us that Tchaikovsky was a supreme melodist. Hallongren’s exceptionally variegated bow control, rock-solid intonation, and attention to subtleties of tempi and dynamics added an extra dimension to a familiar piece. He seemed to almost envelop and fuse with his instrument, such was his uncanny ability to surmount technical obstacles. So impressive was Hallongren’s command of his instrument, the audience spontaneously broke into applause at the same spot in the middle of both performances. This was cello playing of the very highest order, displaying apparently limitless resources. Special guest Adrian Cunningham, a superb Australian jazz clarinetist, last appeared with the New York Concerti Sinfonietta in Jan. 2016. On June 3 and 4, he played the rarely heard, Gershwin-flavored Artie Shaw Concerto for Clarinet from the Fred Astaire film, “Second Chorus” (1940). Cunningham newly orchestrated the work for the resources of the New York Concerti Sinfonietta, augmented by a jazz ensemble consisting of Alberto Pibiri, piano; Jim Robertson, bass; and Paul Wells, drums. Maestro Hostetter got the Sinfonietta to swing along with Cunningham as if to the manner born. Cunningham, a consummate musician, considerably expanded the brief one-movement concerto through improvisation: his two successive performances were almost entirely different from one other. The concerto ended brilliantly with the highest note it is possible to play on the B-flat clarinet; an altissimo “C.” Afterward, I feared that Cunningham might have to check his weary clarinet into Walter “Reed” Hospital! A phenomenal soloist, Cunningham plays with the subtlety and refinement of the finest classical clarinetists, but as a jazz artist, can cut loose to boogie with the best of them, making highly effective use of bent pitches and blues notes. On this occasion, Cunningham also performed his own alternatively wistful and buoyant composition, “What I Can’t Take With Me,” which he arranged for the same forces as Shaw’s Concerto. Two diametrically opposed concepts of Rachmaninoff’s Piano Concerto No. 2 in C Minor, Op. 18, were heard two days apart. On June 4, it was performed by Christopher Johnson, who received his Bachelor’s degree from The Juilliard School in 1996 as a pupil of Abbey Simon and has appeared with the One World Symphony and Rochester Philharmonic, among others. From the opening bars, it became apparent that this was to be a highly unorthodox interpretation. The concerto was not so much performed as deconstructed, the soloist laying bare inner voices and countermelodies in a revelatory manner. One could appreciate the amount of thought, analysis, and practice that Johnson invested in reimagining the concerto so thoroughly. At times, the piano volume was overpowering. Still, the Sinfonietta managed to hold its own, relishing the opportunity to dig in and deliver sensuous sonorities rivaling the Philadelphia Orchestra. Johnson’s technical accuracy was irreproachable; his rip-roaring coda to the finale was electrifying. On June 6, it was the turn of 18-year-old Utah native Trenton Chang to perform the same concerto. As the distinguished critic and pedagogue Mortimer H. Frank stated in his classes at Juilliard, “There is no such thing as a definitive performance. Great masterpieces invite multiple interpretations. There is more than one way to portray Hamlet.” The Rachmaninoff ‘s Second has such universal appeal that Frank Sinatra recorded, as a popular hit in 1945, “Full Moon and Empty Arms,” based on the principal theme of the last movement. Trenton Chang’s approach to the concerto hewed to the traditional, but was no less effective for that. Crouching over the keyboard like a panther stalking Rachmaninoff’s rhythmic motives, Chang’s playing was crystal-clear. By the end, he reached a level of intensity that was thrilling. The Sinfonietta also presented Chang in a full-length solo recital on June 5. Although his Bach and Chopin tended toward the prosaic, he showed a real affinity for Ravel’s Sonatine and “Ondine.” His Mozart Sonata No. 12 in F Major, K. 332, was notable for its proto-Beethovenian first movement and its toccata-like finale. Chang will attend Stanford University in the fall. Returning to play Mendelssohn’s neglected Piano Trio No. 2 in C Minor, Op. 66, on June 3 was Stanley Sisskin, recently heard in Grieg’s Piano Concerto (Jan. 2016) and Mozart’s Piano Concerto No. 24 (Oct. 2014). He was teamed with American violinist Roy Meyer (concertmaster of the NY Concerti Sinfonietta on June 4 as well as previous occasions) and Turkish cellist Emirhan Tunca, previously heard in the Elgar Concerto (May 2015). Meyer and Tunca are experienced and skilled solo, chamber, and orchestral musicians. Their passionate and committed approach to the Mendelssohn Trio made for a compelling listening experience. Their interplay with each other and Sisskin was neither violin-centered nor piano-centric. Rather, the three players were a union of equals, blending beautifully with each other and paying particular attention to phrasing, dynamics, and expression. Displaying tonal warmth and flexible tempos, theirs was a polished and confident performance, rhythmically alive, which projected an almost Schubertian lyricism. Alert and responsive to the Trio’s changing moods, Meyer varied his tone color and vibrato as the music demanded, playing pianissimo passages non-vibrato, then warming his sound as the dynamics increased. Tunca, fiery when necessary, employed well-articulated, incisive bowing. Sisskin’s rapid passagework was fluid and fluent, paying particular attention to the bass lines underpinning the harmonies, providing a solid foundation for the ensemble. The rapport of the players was everywhere apparent. Meyer, Tunca, and Sisskin captured the first movement’s restless, yearning melancholy. The ensemble’s second movement Andante was warm and caressing, gently rocking like a gondola on the Grand Canal in Venice on a moonlit night. The gossamer Scherzo danced weightlessly like a butterfly darting from blossom-to-blossom: the players dispatched it with élan and panache, and no small measure of virtuosity. The last movement quotes the chorale “Praise God from Whom All Blessings Flow.” The players imparted an extra dose of adrenaline to the steadily increasing tempi in the push to the final bars. Also heard on June 3 was Vatsal Vemuri in the “Molto allegro con fuoco” first movement of Mendelssohn’s Piano Concerto No. 1 in G Minor, Op. 25. A 12-year-old seventh grader from Dallas, Vemuri attacked the work with spirit and vigor, unfazed by its technical demands. Fearless and confident, he enlivened the concerto as he effortlessly dispatched the scales and arpeggios, as if he had been doing it all his life. In fact, this is exactly what he has done, having studied the piano for nine of his 12 years. On June 6, Jiayang Jin, age 11, played the first movement Allegro of Mozart’s infrequently heard Piano Concerto No. 11 in F Major, K. 413, written when the composer was 26. Although the concerto did not attain the profundities of Mozart’s later works in this medium, Jin gave it an assured, confident performance. Jin began his piano studies at 5 years of age. His tone quality, pedaling, and cross-hand piano technique were impressive, considering he has only studied for six years. Heard on June 3 in the opening Allegro of Mozart’s Piano Concerto No. 21 in C Major, K. 467, Maxine Park, also age 11, is in the sixth grade. Park was polished and assured, and her success as a young competition winner was evident. Eschewing romanticism, she kept the concerto firmly within the limits of historically informed performance practice. She is to be commended for her enterprise in contacting the 80-year-old master fortepianist Malcolm Bilson to request a copy of his handwritten cadenza, since Mozart’s own cadenza has not survived. Bilson’s stylish cadenza could have been composed by Mozart himself. June 3, Kilee Park performed two Intermezzos and a Ballade from Brahms’s Six Klavierstücke, Op. 118, Nos. 2-4. Her playing of these late Brahms masterpieces was surprisingly passionate and vital, rather than autumnal. Her playing had a spark and authority that commanded attention, taking full advantage of Brahms’s distinctive pianistic voicing. Also heard were two singers. On June 4, 17-year-old soprano Gwyneth Campbell returned to perform two opera arias suited to her youthful vocal resources. Singing Pamina’s aria “Ach, ich fühl’s” from Mozart’s “Magic Flute,” and the charming “Chi il bel sogno di Doretta” from Puccini’s “La Rondine,” Campbell displayed a pure tone and an extended high register. Her voice should gain in amplitude as she matures. On June 6, baritone Jim Trainor sang two of Ralph Vaughan Williams’s serenely spiritual “Five Mystical Songs.” Trainor, who is the director of music for the Church of St. Gregory, performed “Love Bade Me Welcome,” and “The Call,” in an appropriately unaffected manner. Essential to the excellence of these concerts was the splendid quality of the musicians of the New York Concerti Sinfonietta and its versatile conductor, Paul Hostetter. But the principal contributors to the distinction of the performances were the exceptionally talented soloists discovered by Dr. Julie Jordan. The New York Concerti Sinfonietta will next perform at Carnegie Hall on Oct. 15, 2016, and May 12, 2017. Additional concerts will take place at historic New York City venues, as well as throughout the 2016-17 season. Annual auditions will be held in Ireland, California, Utah, Texas, Florida, and New York City. For information, or to apply for forthcoming competitions and debuts, contact dr.juliejordan1@gmail.com or newyorkconcertisinfonietta.com. Michael Sherwin writes for the Epoch Times, Wagner Notes, and other publications. He is producing a 2-CD album of 20th-century American choral music for the National Endowment for the Arts.